Today I was feeling bored about eating lunch. I didn't want the same old boring staple of what I make for my kids. I will usually eat pbj, tuna, tortilla chips w cheese etc... I remember at my last Weight Watchers meeting there was conversation about not changing up what you eat and how boredom can be the track that derails your healthy eating. I spread the cheese wedge on the rye bread and had that with the spinach salad I made. The salad I made was a version of a spinach salad I had years ago. Wash spinach, break it into pieces and place in bowl. 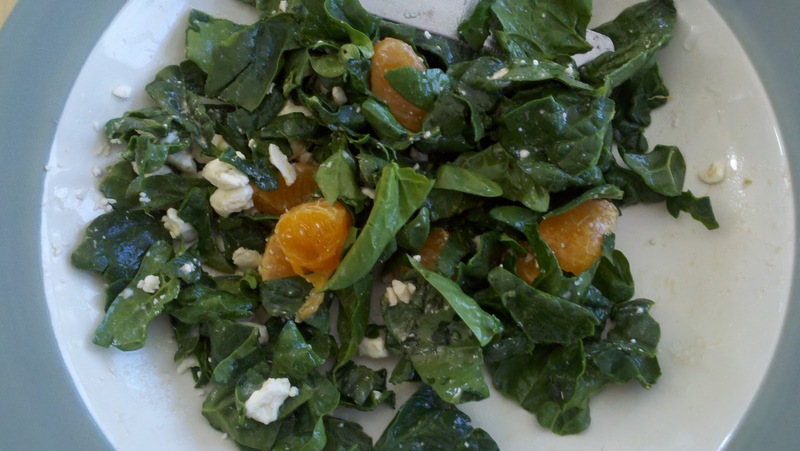 Peel clementine (they are really good this time of year but you can use any fruit) and cut segments in half and place on top of spinach. Take 1/4 c of feta and place in bowl with spinach and clementine. Mix equal parts extra virgin olive oil and balsamic vinegar ( 1/4c of each - add slightly more vinegar to taste). Add 1/4tsp of dry mustard. Shake or stir and serve. If you put this dressing in the fridge the olive oil will harden. Just soak the container/bottle in some warm water for a minute or two and the oil will solidify and you can then shake and use. This salad was very satisfying and yummy! - My husband enjoyed it as well. Good to see you deviate from your norm...love those kind of salads! !